Support what’s important to you, on a schedule that fits your budget and busy lifestyle. 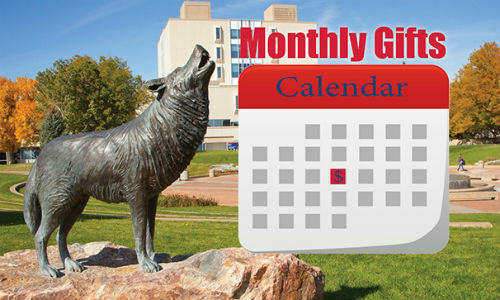 Your monthly gift helps build a predictable source of funding for CSU-Pueblo. Reliable donor support leads to significant advances in Pack-wide priorities such as scholarships, academic programs, research, technology enhancements, and preservation of campus. Monthly giving saves administrative costs. It's the greenest giving option because it saves paper, postage, and other resources by eliminating renewal notices in your inbox, and mailbox. You can set up your monthly contribution online safely and securely. Choose the area you want to support in our secure online giving page. If the area is not provided, please include in the comment section where you wish to have your contribution put towards. Check the box "Recurring Gift." Choose the 5th or 25th of every month for your donation to be charged. Complete the payment information using Visa, MasterCard, American Express, or Discover. Your first donation will be charged on the day you set up your monthly gift, and then will repeat on either the 5th or 25th (depending on what you choose) of each month after. You can change or cancel your ongoing contribution anytime by calling the CSU-Pueblo Foundation at 719.549.​2380. You can also set up a monthly gift by printing and mailing in this gift form.